Gov. 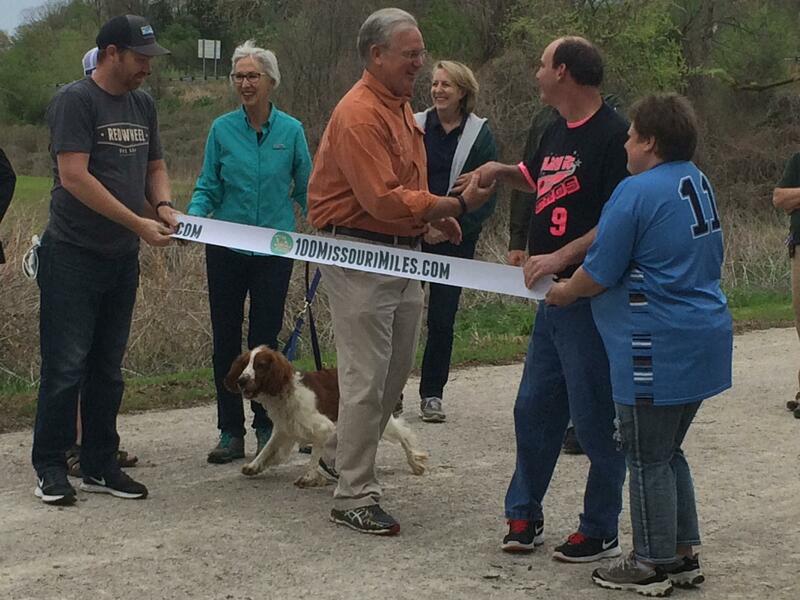 Jay Nixon (center) shakes hands with people attending a ceremony launching the 2015 100 Missouri Miles Challenge in Jefferson City, Mo April 15, 2015. Jay Nixon said he wants Missourians to exercise for a total of three million miles in the next year during a speech Wednesday afternoon in Jefferson City launching this year's 100 Missouri Miles Challenge. The Governor's office says over the past two years Missourians have logged over 3.3 million miles while exercising, while Nixon and the First Lady have completed almost 2,000 miles combined. Citizens gathered to hear Nixon’s speech as well as walk the Katy Trail in Jefferson City in the trail’s 25th year anniversary. “We were chosen as the best trail state, and we as Missourians need to get out and see them,” Nixon said. The trail stretches 240 miles from Machens, Mo in the St. Louis Area to Clinton and serves approximately 400,000 visitors each year. Nixon says the Katy Trail as well as other trail-related expenditures, generate nearly $18.5 million a year in economic impact for the state. In addition, a 2012 economic study showed these trail-related expenditures supported 367 jobs. “It’s a great example of Missouri’s outdoor economy,” Nixon said. For one Missourian, these trails and parks are more than just a source of revenue for the state. Nixon challenged Missourians to exercise for at least 100 miles in 2015 in order to maintain a healthy lifestyle. "We are here again to call on Missourians to get out and get active with the family and their friends to make the 100 Miles Challenge part of a healthy lifestyle of 2015,” Nixon said. Last year, 23,489 Missourians logged miles for the state, and Nixon said he hopes this number will increase this year.